Wash your face with our gentle, non-irritating and effective Mild Oatmeal Cleanser, which will leave the skin feeling clean and supple. Experience the silky feel of Eye Cream - anti-aging and nourishing cream for the tender skin around the eyes. 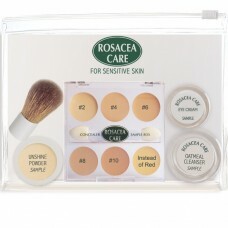 Find a perfect match for your skin among six colors in the Concealer Sample Box. Get a perfect matte look with UnShine Powder. Plus receive a FREE Kabuki Mini-Brush! Start with the Mild Oatmeal Cleanser, followed by Eye Cream, and the remaining products until you have tried them all.